Al Mar Combat Smatchet is mint with the great original sheath. The sheath is near mint because it is cut slightly where the knife comes out. The blade is 10" and it is 16" overall. Serial number # 133/200 and Model 4015. The handle is Zytel and the blade is 6A stainless steel and 3/16" thick. It has a blind hole on one side of the blade tang (ricasso*) so the user can identify which of the two edges he is using even in the dark. The Smatchet is a fighting knife based on the Celtic short sword and developed by Colonel Rex Applegate of the United States OSS and Captain William Ewart Fairbairn of the British Royal Marines. We have sold two other serial numbered Smatchet's, the first was sold in the Fall of 2000, the next in May 2004. Al did not make very many of these in the standard run and of course only 200 in the preproduction run. Get it before it is gone! If you compare Al Mar's Smatchet with any of the other ones on the market you will see a big difference in fit, finish and quality. Al's is much better! About serial numbered Al Mar's: From the day that Al started producing knives (1979) he ordered 200 from the factory on the first run. When those 200 came in they were sent out to the dealers. If the dealers response was good then Al ordered some more. If the dealers respond was bad then that was the end of the knife in production. Either way good or bad that means that there are only 200 serial numbered Al Mar's of every knife that he produced. This of course makes each one of these pre-production knives very desirable. The only thing better is a proto type Al Mar knife, and I have only had two of those since 1991. Signatures on the back of the Smatchet. 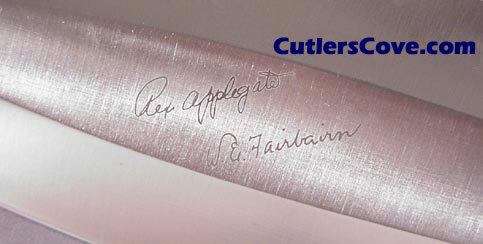 The signatures on the blade are from the men who designed the blade: Colonel Rex Applegate and Captain William Ewart Fairbairn. Several of their books are listed at the bottom of the page.